MASC introduced organic insurance in 2005 for wheat, oats and flax, three crops that had passed the 5,000-acre minimum acreage needed for a crop to become insured. Coverage is based on a producer’s 10-year history with that crop, although the corporation has added a five-year “fast track” for new organic producers. The streamlined option weighs each year by 20 per cent until probable yield is based totally on the individual. The company sets coverage at 50 per cent of conventional yield to start (or in years without data), something Doug Wilcox, MASC manager of insurance program development, says is in line with provincial averages. Organic wheat averaged 45.3 per cent of conventional yield from 2005-16, according to MASC. Oats and flax were similar at 46.3 per cent and 47.1 per cent respectively. Those three crops remain the only insurable organics, although other crops can be covered under conventional insurance. Organic producers have pushed back against that requirement, arguing that conventional policies include an unrealistic weed management expectation and the value of grain doesn’t reflect what they can get in the market. However, organic insurance considers early-season weeds a “designated peril” for reseeded acres and have more tolerance for fertility issues, MASC claim services manager David Van Deynze has said in the past. The MOA hopes to add barley, rye and peas to the list of insurable crops, although MASC says none of those three approaches minimum acreage. According to MASC’s Wilcox, 4,194 acres of organic barley were grown in 2012, dropping to 1,964 last year. Rye, meanwhile, dropped from 4,190 acres in 2012 to 2,991 in 2016. No data was collected on organic peas. Wilcox drew numbers from provincial estimates in 2012 and the Canada Organic Trade Association Annual Report in 2016. Of Manitoba’s organic crops, only forage and pasture land approach the necessary acres, Wilcox added. 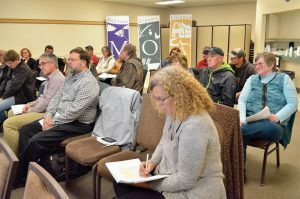 “We’ve been asked once or twice in the past to potentially insure those crops, but we’re worried about taking on a large acreage of organic crops when, with the core programs we have right now having high losses, we’re hoping to get those programs organized and straightened out before we expand to forages or barley or hemp or whatever is recommended we go forward with next,” he said. The company has paid out more than it has taken in premiums for its organic policies. From 2005-15, the company paid out $2.8 million, compared to $2.5 million collected. Because of that loss, MASC considers an organic policy about three times riskier than conventional insurance. The minimum acreage is not always a concrete rule, Wilcox said, and exceptions may be made for crops expected to expand. One of those exceptions might be yellow peas. The pea market in general is expected to rise in Manitoba with the Roquette pea protein plant in Portage la Prairie that’s currently under construction. Ground broke on the facility this summer and it is expected to start contracting peas next year. Organic growers got similarly good news. In mid-September, sustainable plant protein company Verdient Foods announced a new pulse-processing facility in Vanscoy, Sask. The facility is expected to take up to 160,000 tonnes of grain each year. At the same time, Verdient Foods announced its partnership with the Saskatchewan Food Industry Development Centre, a four-year bid to develop more products using organic pulses. The MOA has also argued that insurance does not take green manure properly into account. The practice is commonly used to manage nutrients by terminating plants before maturity and plowing them into the soil. In some systems, organic producers may underseed a cash crop with a green manure legume to be terminated after harvest. That underseeded legume remains small until the main crop is removed, Storey said, after which the secondary crop grows and is eventually plowed in. Storey noted, however, that a wet year may boost that underseeded crop to overtake the main crop, leading adjusters to invalidate a producer’s insurance. MASC, however, considers this intercropping. The corporation has labelled intercrops too risky for insurance, something that has also frustrated conventional farmers experimenting with the practice. Wilcox notes that intercrop acres are low, making MASC’s minimum acreage an issue. He also cited possible mismanagement and confusion over which crop is the primary crop to be insured. “When it comes time to harvest, are there going to be management issues related to harvest that insurance shouldn’t pay for because one crop has matured much earlier than the other, for example, and then you get crop loss during harvest as a result of mismatching maturities?” he posed. A “novel crops” insurance has been suggested to solve both the green manure issue and lack of covered crops. Wilcox’s team has designed a prototype program, although it has yet to be approved by MASC. Payouts have been another sticking point for organic producers, who say that insurance does not recognize their premium market price. Currently, organic oats and wheat are paid out at 150 per cent of conventional crop price, while flax is valued at twice the conventional price. According to Storey, those numbers should all be two times or more, if market prices were reflected. Saskatchewan, a province with 500,000 organic acres compared to Manitoba’s 100,000, offers a multiplier of 1.9, the MOA president said. Wilcox acknowledged the gap, but said MASC is reluctant to increase payouts, given their current costs. Solutions have already begun to float on the issue, including higher buy-in from producers to increase MASC’s pool and lower risk. There has been no timeline announced for the working group so far.